Starting with lockups. Harashima’s necklock, Kenny returned. Then Kenny took Harashima’s arm and twisted. Then Harashima’s hammerlock to Kenny but Kenny returned it to headscissors. After the break, started with lockups, then Kenny’s armwhip and ran to the ropes. Harashima’s leapfrog and then ran to the ropes. Kenny’s leapfrog to dropkick – count 2. Kenny’s hammer-punch for 2 times, backhand-chop at the corner. Then threw Harashima to the opposite corner and ran to hi. But Harashima returned to Kenny from the corner but Kenny backflipped and Harashima couldn’t catch him. Kenny climbed up the corner and twisted cross body to Harashima but kicked by his knee to Kenny. 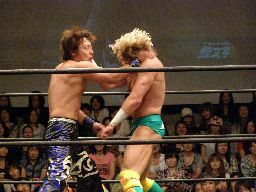 Harashima delivered 2 guillotine drops to Kenny and dropkick to Kenny – count 2. Harashima delivered hammer-punch to Kenny, then necklock with knee on the belly. Kenny escaped somehow. Both stood up and delivered elbows each other, Harashima’s fistpunch to Kenny and Kenny lay down, Harashima’s stomping to Kenny. Then lifted up Kenny to stomach-block and knee drop – count 2. Harashima’s soccerball-kick, cobratwist. Then Kenny reversed with hiptoss. Kenny ran to the ropes but Harashima’s kitchen-sink to Kenny. Harashima lifted Kenny with brainbuster and threw him to the top rope. Kenny fell down to the ringside. 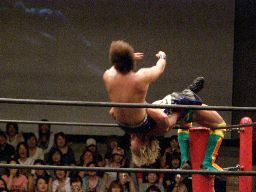 Harashima gave swan-dive elbow to Kenny. Then came back to the ring again and elbow-smash each other. Kenny’s back-kick and Harashima’s back-kick. Harashima’s swan-dive press from the apron but Kenny blocked. Kenny shouldered Harashima to Death by Roderick and running hammer-punch for 2 times. Then tracekick to Kotaro-Face crusher to Harashima. Kenny’s middle kicks or 3 times and then Stop! Enzuigiri to Harashima and Harashima fell down from the ring. Then Kenny’s No touch Tope Con Hilo to Harashima ans came back to the ring. Kenny’s Aoi Shoudou (cross-armed fisherman’s buster) to count 2. Then after several back-and-forth, Kenny tried to delivered Hadoken but Harashima blocked it and gave reverse Frankensteiner. Harashima delivered Soumatou, and Kenny delivered Hadoken – both were knocked out. After stood up, both slapped each other, then clothline at the same time. 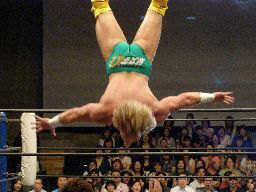 Harashima’s firebird splash – count 2. Harashima tried to deliver reverse Frankensteiner from the corner but Kenny hold off and changed it to his electric chair German suplex (from the corner post). Then delivered Hadoken but it was count 1. Then Kenny’s dragon suplex to Harashima but count 2. Kenny delivered several knee kick to Harashima and delivered Hadoken again – this time count 3 to win. After the match, Kenny was on mic and promised DDT fans that he would come back to DDT again soon. Since this is his last match in Japan and he’ll be back to North America pretty soon, this is our final updates on his Japan tour. Thank you very much for checking us on Kenny’s updates in Japan. We also would like to thank Extreme Party for his detailed reports on every match. Without his support, we could not deliver such detailed report to you guys. Let me explain about Great Puroresu – its’ really a minor indie promotion. Kenny controlled whole match from the beginning to the end, and only “pro-wrestling moves” he made was Tony Jaa (Running Double Knee strike with opponent on chair) on the ramp and Dragon Revolution (pump-handle suplex) as finisher. According to Great Puroresu fan, it’s miracle that JomTaro “wrestled” in a “single match”. I guess this word tells you all.